The word "photo" means light. "Synthesis" means putting together. The word photosynthesis means putting together with light. Plants contain chlorophyll. Plants take in water and nutrients from the soil through tiny hairs on the roots. The water and nutrients are transported through the root hairs to the roots, and then are drawn up the stem through tubes that are arranged in bundles. There are two different kinds of tubes: phloem and xylem. Xylem tubes carry the needed water and nutrients up the stem to the leaves where photosynthesis takes place. Phloem tubes carry sugars down from the leaves. These sugars are stored in the lower stem and roots. There is a layer of cells found just below the top surface of a leaf. These cells contain chloroplasts. Chlorophyll is found in the chloroplasts. 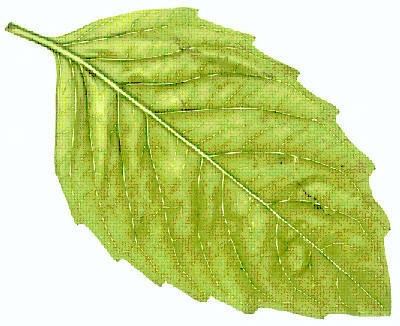 When sunlight shines on the top of a leaf the light energy is trapped by the chlorophyll. This energy is stored for later use. Air passes in through tiny holes on the bottom surface of the leaf. Molecules of carbon dioxide from the air reach the cells where chlorophyll has trapped energy from sunlight. This trapped energy turns the carbon dioxide into a variety of sugars and oxygen. The sugars move down the phloem tubes and will be stored as starch or sugar in other parts of the plant. The cells use this stored food to grow and do their work. Examples of stored sugars we gather and eat from plants include apples, oranges, plum, and grapes. Examples of stored starches include potatoes and corn. We eat many plants that provide us with their stored starch and sugar. Just like plants we convert this stored food into energy for our cells. Directions: Answer the questions about photosynthesis. The word photosynthesis means putting together with . tubes carry the needed water and nutrients up the plant's stem to the leaves. tubes carry sugars down from the leaves. A layer of cells found just below the top surface of a leaf contain . Plants turn carbon dioxide into a variety of sugars and . Which of the following are examples of stored sugar? Which of the following are examples of stored starch? The word "photo" means . The word "synthesis" means putting .